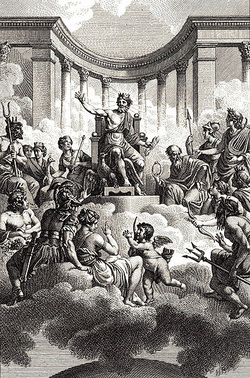 In Greek mythology, The Twelve Olympians, or Dodekatheon were the most worshipped and revered deities residing on Mount Olympus with Zeus as their king. Each movement of Dodekatheon Sketches is a musical portrait of each of these gods, not telling a specific story about them, but portraying some of their principal attributes and characteristics. Book I begins with a noble Fanfare for Athena, who was among many things, the goddess of just warfare, law and order, and wisdom. The city of Athens is named for her and the Parthenon built in her honor. A patroness of lofty and high ideals, Athena was born fully grown, fully armed, and with a war cry from the head of Zeus. The noble fanfares of this movement ring out from the hall and on stage, almost bringing images of a ceremony in honor of Athena in the Parthenon. While Athena represents just warfare, Ares, God of War represents the dark and bloodlust side of war. Ares' interests are never in the causes of war or even the outcome, but war in itself, and enjoyment in the sport of killing. He is the yin to Athena's yang, for even if Greeks went to war for a noble cause, they also prayed to Ares for strength and victory. The principle theme of Athena's fanfare is "corrupted" and "manipulated" into war cries sounded throughout the hall as if from opposing sides in battle. As is the nature of war, the movement soon gives way to chaos and destruction culminating in dense clusters of all twelve pitches. The chaos of Ares gives way to Demeter, Goddess of the Harvest. Watching over grains, a fertile earth, and the cycle of life and death were among her godly duties. "Demeter" is a peaceful and pastoral movement, yet tinged with regret (perhaps stemming from the destruction of the previous movement). Yet just as the seasons bring new beginnings and new harvests, so does the cycle of life and death. As sounds of regret and poor harvest fade, hope rings out in the form of birdcalls taken from Vol. 5, Part 1 of Oliver Messiaen's Traité de rythme, de couleur, et d'ornithologie sounding throughout the hall. Yet the cycle must continue, bringing sadness just as it brings hope. Dodekatheon Sketches is an ongoing work which will eventually be comprised of twelve movements, one for each deity of the Dodekatheon. When completed, the piece can either be programmed as a whole or individual movements.